"Speak to the children of Yisrael: Tell them to make tassels on the corners of their garments throughout their generations, and to put a blue thread in the tassels of the corners. That you may remember, and do all My Mitzvot, and be set apart to your Elohim. I AM YEHOVAH your Elohim, which brought you out of the land of Mitzrayim, to be your Elohim: I AM YEHOVAH your Elohim . Dvarim 22:12 You shall make thee gedilim (fringes, tzitzt, twisted threads) upon the four quarters of your vesture, wherewith you coverest yourself. Malakhi 4:2 But to you that fear My Name shall the Sun of righteousness arise with healing in His wings; and you shall go forth, and grow up as calves of the stall. Tzitzit or tzitzis (Hebrew: Biblical ציצת Modern ציצית) are "fringes" or "tassels" Kraspedon (greek) the edge of His cloak, the hem of garment. Mark 6:56 Wherever he went, in towns, cities or country, they laid the sick in the marketplaces. They begged him to let them touch even the tzitzit on his robe, and all who touched it were healed. 5:26 and had suffered a great deal under many physicians. She had spent her life savings; yet instead of improving, she had grown worse. 5:28 for she said, "If I touch even his clothes, I will be healed." 5:29 Instantly the hemorrhaging stopped, and she felt in her body that she had been healed from the disease. 5:30 At the same time, Yehoshua, aware that power had gone out from Him, turned around in the crowd and asked, "Who touched my clothes?" 5:31 His talmidim responded, "You see the people pressing in on you; and still you ask, `Who touched me?'" 5:32 But He kept looking around to see who had done it. 5:33 The woman, frightened and trembling, because she knew what had happened to her, came and fell down in front of him and told him the whole truth. 5:34 "Daughter," He said to her, "your trust has healed you. Go in peace, and be healed of your disease." 5:35 While He was still speaking, people from the synagogue official's house came, saying, "Your daughter has died. Why bother the rabbi any longer?" 5:36 Ignoring what they had said, Yehoshua told the synagogue official, "Don't be afraid, just keep trusting." 5:37 He let no one follow him except Kefa, Ya`akov and Yochanan, Ya`akov's brother. 5:38 When they came to the synagogue official's house, he found a great commotion, with people weeping and wailing loudly. 5:39 On entering, he said to them, "Why all this commotion and weeping? The child isn't dead, she's just asleep!" 5:40 And they jeered at him. But He put them all outside, took the child's father and mother and those with Him, and went in where the child was. 5:41 Taking her by the hand, he said to her, "Talita, kumi!" 5:42 At once the girl got up and began walking around; she was twelve years old. Everybody was utterly amazed. 5:43 He gave them strict orders to say nothing about this to anyone, and told them to give her something to eat. Karaite Gedilim (chain) method http://www.karaite-korner.org/tzitzit.shtml The first is that the Karaites do not take the Tanach literally but rather require that every interpretation stand up to the same objective scrutiny regardless of its source. 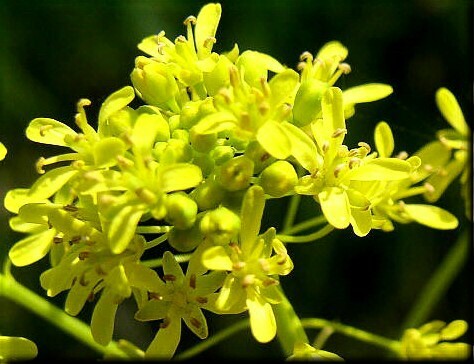 The Karaite do not use Techelet that is from Murex snail which is derive from unclean animal. 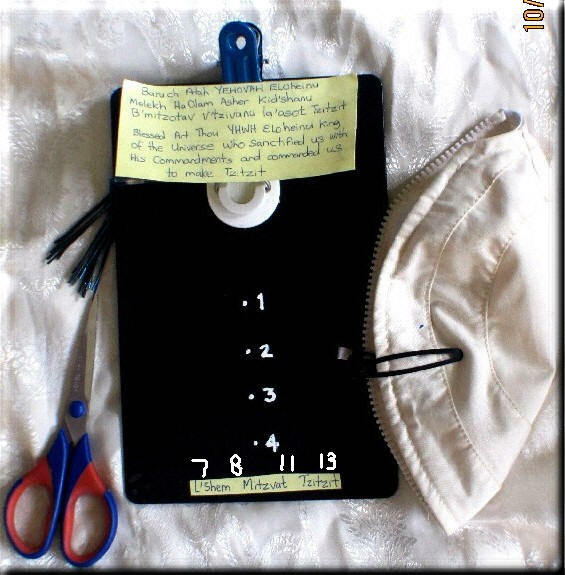 A closer look at the passage in Numbers 15,37-41 shows that the command of Tzitzit applies only to clothing, as the passage specifically states "And they will make for themselves Tzitzit on the corners of their garments" (Nu 15,38). The Biblical Hebrew word for garments (BeGeD) relates to something that is worn as clothing. 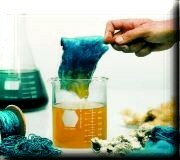 The Torah does not state which dye must be used to create the blue strings. Any dye that produces the color blue is sufficient. The strings of the Tzitzit are to be tied into a chain-like knot and placed on the corners of four-cornered garments. This is commanded in Dt 22,12 which states "Chains [Gedilim, cf.1Ki 7,17] shall you make for yourself on the four corners of your clothing, with which you cover yourself with." 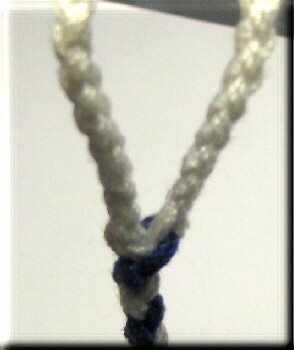 The chain-like knots can be made in any number of ways. The important thing is that they have the appearance of links in a chain (Gedilim) and that they include at least one blue strand. The word Tzitzit itself literally means a "braid, plait" as in the verse "and took me by a plait (KJV: lock) of mine head". Thus the design of the Tzitzit must be like that of a braid/plait of hair which is the same design as the links in a chain. The modern Ebionite Movement distinguishes between tzitziyot (fringe) and p'tiylot (strings, cords) the latter being all tekhelet, or sky-blue derived from any source containing dibromoindigo. Any shade or variation from greenish blue, to turquoise, and darker, or a range naturally occurring in the dyeing is acceptable. 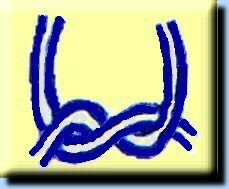 Any style of knots and windings is allowable however most use the most typical 7-8-11-13 configuration. 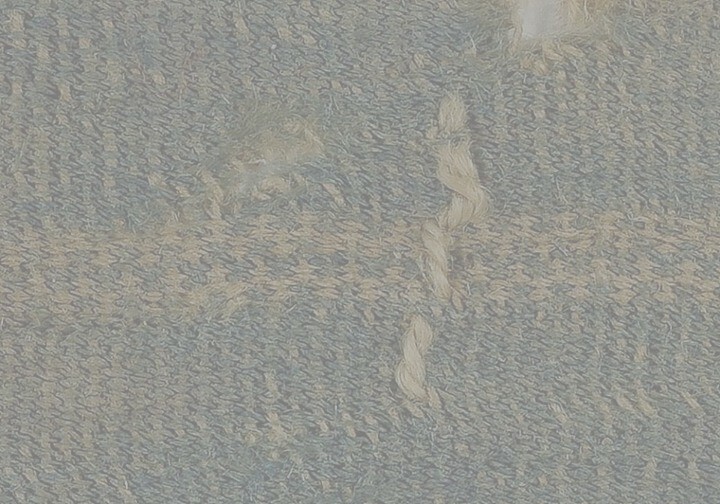 Garments must have both fringe and cords to satisfy the commandment as interpreted by Ebionites. In addition to the talit or talit katan, the p'tiylot might be tied into a long black scarf. 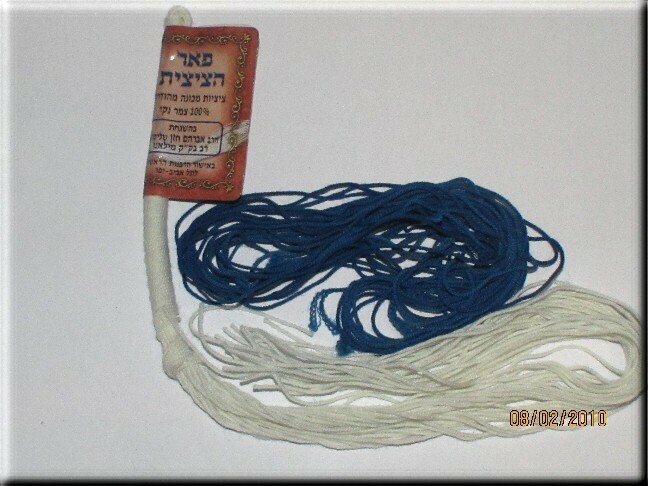 The Shamash is the Techelet cord of blue that wraps the white thread and it is the longest among the white cords. 13= the last set of windings, is equivalent in value to the word "echad" which means "one." Take the sum of the first three numbers (7+8+11) and equate that with Hashem's Name, then the 13 which remain can also be interpreted to reflect the 13 attributes of Hashem, as articulated by Moses Maimonides and set to verse in the Yigdal. Tie your own Tzitzit tassels with these beautifully hand dyed cords. 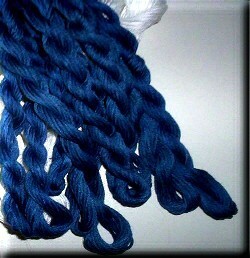 Dyed with natural Indigo (plant based.) 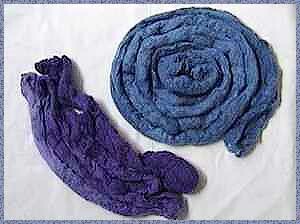 These cords are dyed with a clean plant base dye according to leviticus 11 we do not use animal based dyes on our cords, such as the snail dyes that are used by other merchants.The reason Indigo is so favored among believers today is that it is a clean alternative to the unkosher snail (Murex trunculus) dye commonly used. 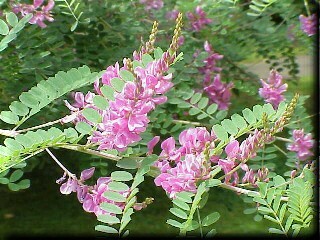 (Lev 11:11-12) It is the same exact chemical make-up of the traditionally used snail dye, except instead of deriving from the blood of an unclean sea creature, it is made from the natural Indigo plant Indigofera Tinctoria. 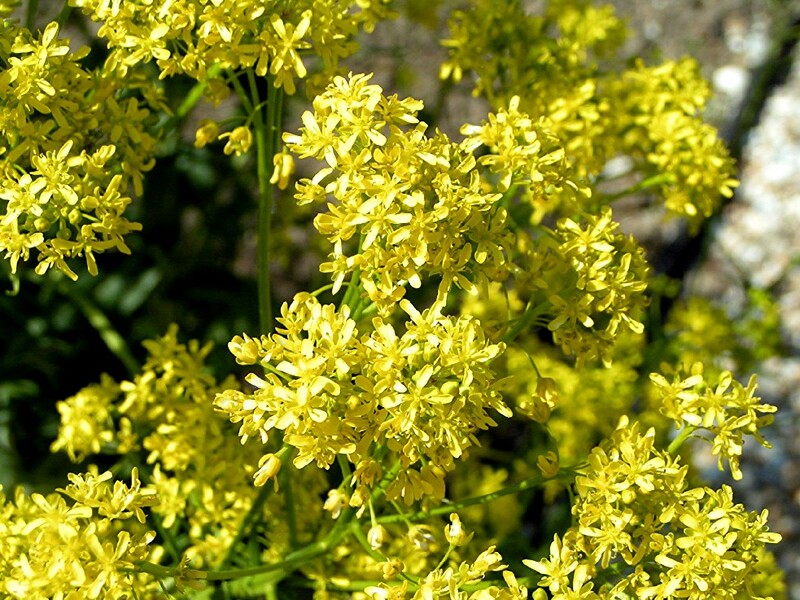 You can grow woad plants as the above seeds, a year old Woad plant and the dyed in powder form. at this site - click here. DISCLAIMED:- It is yet to be known and if whether have been certified if it could be consider as kosher 犹太教洁食律法 since it is plant substance. Tying the Tzitzit are by Jewish men. Before proceed tying the Tzitzit or even wearing Tallit - wash your hand clean. Ensure the Tallit place on clean place free from any unclean stuff. According to the Halakhic, the tzitzit should be tied by a man so to be fully appreciate the Commandment and exhibit his full belief in HaShem. Female's refrain When in stage niddah avoid tying the Tzitzit. This way is the fixed looping on the Talit corner. I usually prefer this method which is more proper way. This is a half knot. Begin with by making a loop. Step 1 Measure the length from the bottom edge of the Tallit which has a hole where the Tallit will latch through. Step 2 You have to make the loop which is two times that length. 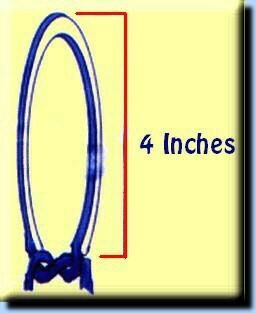 For instance the measurement from the bottom of the hem to the hole is usually 2 inches then the measurement of the top should be 4 inches. 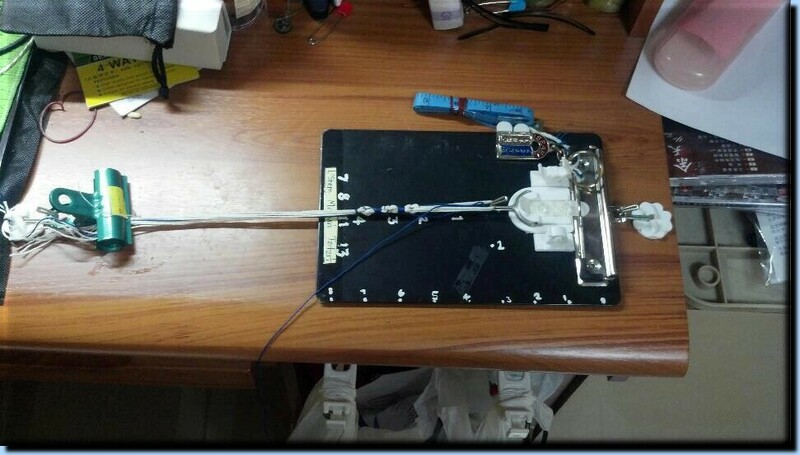 use hairpin to pull through the hole. Then tie 2 half knots. 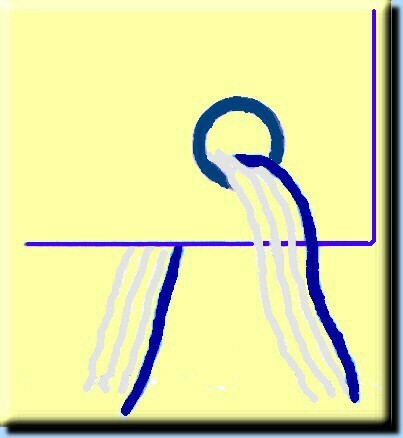 Take three white cords and one blue cord Longer than the three white cords known as shamash about 4 feetlong /64 inches each. Feed trough corner hole bringing equal measures on both sides. (1 Feet = 16 inches each). 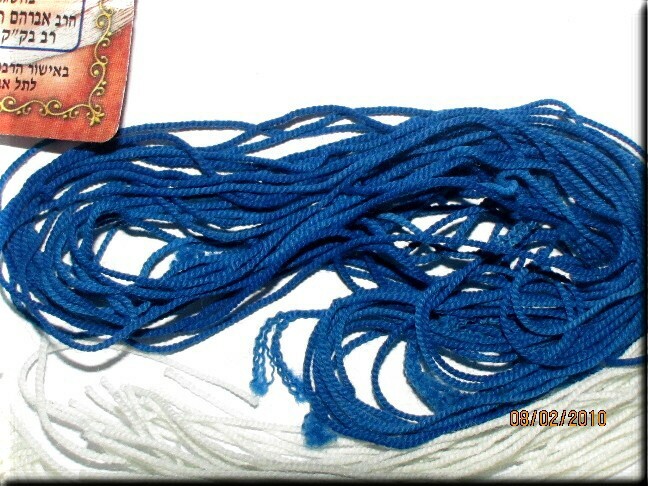 Note that the blue cord does not fate coloured becomes invalid.The Rabbinical tzitzit of the white thread length each is about 24 inch + 18 inch. Tie 2 half knots, to finish the tassel, then cut then cut the ends to desired length. If you prefer you can make a knot on the end of each cord to prevent fraying. Please remember that you MUST say “L’Shem Mitzvat Tzitzit” before putting the strings in to the hole of the talit and also when tying the knots ! The Artscroll Siddur describes : I am ready* to wrap my body in Tzitzits, so may my soul, my two hundred forty-eight organs (positive commandments) and my three hundred sixty-five sinews, be wrapped in the illuminations of Tzitzit which has the numerical value of six hundred thirteen (Negatives commandments). z=90 Yuh=10 Z=90 Yuh=10 Tav= 400 totaling 600 the 5 knots and 8 threads of each fringe make up the other 13. By wrapping our bodies in the tallis, we dedicate ourselves totally to the task of serving Hashem. This Prayer below represents the concept that Hashem protects those who serve Him. Asher kidishanu b'mitzvotav v'tzivanu la'asot Tzitzit. Please remember that before tying begins a Hebrew blessing you MUST say “L’Shem Mitzvat Tzitzit” (meaning for the sake of the Commandment of Tzitzit) before putting the strings in to the hole of the Talit and also on every tying every two knots! 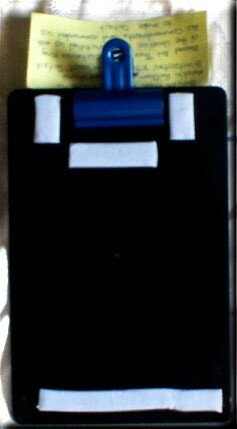 The blue and white Tzitzit which I have learn how to tie the Tzitzit. 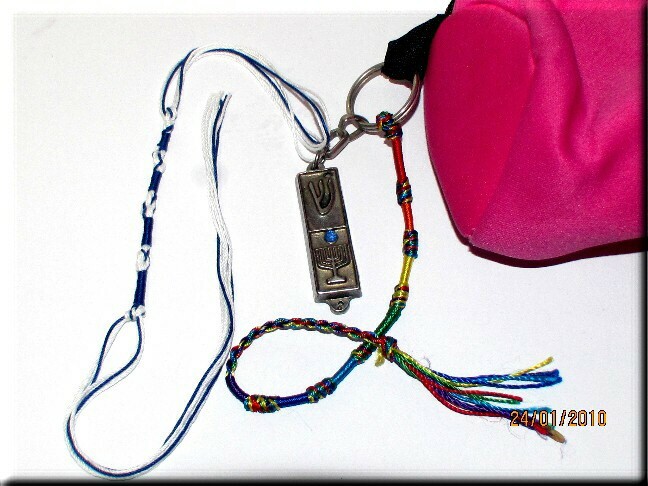 The Blue thread single out the three white is the shamash, which represent Yehoshua who is the Living Torah.Next to it is the key chain Metzah the colourful rainbow tzitzit is one which I bought it from Cambodia not to be mistaken as the biblical tzitzit, it is not tzitzit. The four Tzitzit all in line same direction and the Atarah arrow pointing toward the Tzitzit - to place on the shoulder as the tzitzit hanging toward you so that you can hold on the 4 tzitzit while reciting the blessing of putting on Tallit --> Before reciting the blessing remember to check the Atarah, fringes, Tzitzit ensure they are not worn out or faded Tzitzit are invalid. Blessed Art You, YEHOVAH Eloheinu, King of the Universe, who makes us set apart with commandments, and has commanded us to wrap ourselves in the Tzitzit. Kiss the end of Atarah where the last word of the blessing is embroidered, and then a beginning where the first word is. In order for tallitot to considered to be Kosher, It cannot be made of a mix of wool and linen. It should be created out of one type of fabric, for example all wool or all cotton. The Tallitot and tzitzit must be of the same type of material, either all wool or all cotton. Ensure to check the tzitzit, or fringes, each morning to ensure they are knotted and tight prior to putting the tallit on. Should there be any of the strings that are broken should be replaced before using it. If more than one string is missing the tallit is no longer kosher. 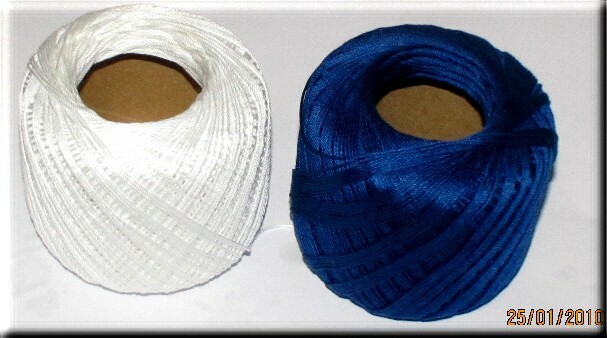 If the knots have unraveled, the tallit is still kosher, it is best to get the knots tightened as soon as possible. You should be careful not to bring the tallit into the bathroom with you! many synagogues have a tallit rack outside of the bathroom, if you see a room in a synagogue with a sign that tells you to remove your tallit before entering, you can safely assume that the room is a bathroom! How to don and fold your Tallit? This is a how to video on the proper use of donning the Tallit, reciting the prayer blessing in Hebrew and then how to properly fold it to store in your Talis bag. The tallit was actually derived from a piece of clothing called the tallit katan, or the arba kanfot, which literally means four corners. The tallit katan, in turn, is a piece of undergarment, worn like a regular T-shirt underneath regular clothing (however, the tallit katan is never directly worn next to the skin, so basically another piece of clothing should be used underneath it). It is a special four-cornered garment, similar to a poncho, called a tallit katan ("little tallit"), so that they will have the opportunity to fulfill this important mitzvah all day long. 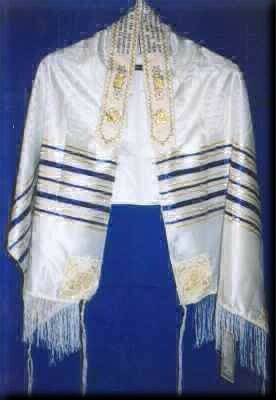 The tallit katan is worn under the shirt, with the tzitzit hanging out so they can be seen. *11:31 These are tamei to you among all that creep: whosoever does touch them, when they be dead, shall be tamei until the Erev(ערב). *11:31 These are tamei to you among all that creep: whosoever does touch them, when they be dead, shall be tamei until the Erev (ערב). Revelation 21:21 And the twelve gates were twelve pearls – each one of the gates was a single pearl. And the street of the city was clean gold, like transparent glass. Why is this Garment Special? Rosh (Head) Tefillin has 4 compartments, at the side of the tefillin has the Hebrew letter Shin meaning Shadai "Almighty"
the Yad (arm) Tefillin (wear) on weaker arm does not have compartment only have all the scripture fits in a box. The "sign" in Hebrew meaning literal tangible sign. and practice in sod level or spiritual understanding. To recite the SHEMA one must have the Tefillin on. Who is Yehoshua Ha Moshiach?